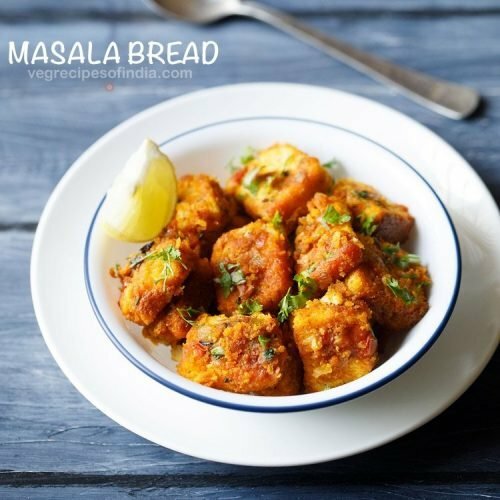 masala bread is one of the quickest, yummiest and easiest snack you can make with bread. firstly cut 5 to 6 bread slices in small cubes. keep aside. finely chop 1 medium onion, 2 medium tomatoes and 1 green chili. heat 2 tablespoons oil in a pan and add 1 teaspoon ginger-garlic paste. sauté for some seconds till raw aroma of both ginger and garlic goes away. then add chopped onions. mix and then begin to sauté onions on a low to medium flame. sauté onions till they turn translucent. keep the flame to a low and then add the following spice powders – ¼ teaspoon turmeric powder, ½ teaspoon red chili powder, ½ teaspoon cumin powder and ½ teaspoon garam masala powder. mix very well on a low flame taking care that the spices do not burn. then add ½ cup tightly packed finely chopped tomatoes and 1 green chili (chopped). mix well. season with salt as per taste. do add less salt as bread also has salt. mix again. sauté tomatoes till they become pulpy and soften. you should also see oil releasing from the sides of the onion-tomato masala. add a few tablespoons water if the tomatoes stick to the pan. when the tomatoes have softened, add 1 tablespoon chopped coriander leaves and 1 to 2 pinches kasuri methi (crushed). kasuri methi can be skipped if you don’t have it. mix again and then add the bread cubes. mix bread cubes very well with the onion-tomato masala and sauté for 1 to 2 minutes. for a crispy texture in the bread you can sauté them for some more time stirring at intervals on a low to medium-low flame. while serving bread masala drizzle some lemon juice on top. you can even garnish with a few chopped coriander leaves. serve bread masala hot or warm.